I'm back from the quilt show I attend every year, at which I had a marvelous time. More than marvelous, actually. I've been needing a creative kick in the backside, and this definitely did that, but it was nice just to be with my sewing sisters. Quilters are such lovely people. So many amazing quilts were entered I practically burned up the camera snapping pics. Among the surprises, there were lots of dimensional quilts with objects couched right on, or faux 3-D appliques artfully. Think a butterfly quilt with the butterflies rising out of the quilt as if they mean to fly off, and you'll get the idea. Adult coloring books have also invaded quiltworld, as they influenced one entrant to design and make an adorable elephant wall hanging based on the bright coloring style of the books. After all the fun I had with the Barcelona coloring book I might have to do something like that. The only downer was that I didn't have a lot of money to spend at the show this year, but the universe came to the rescue. On the second day I won a door prize bag with a quilt book, a fat quarter and a sample of cotton fiberfill. The author of the quilt book made up patterns based on her great-grandmother's journals, and I never win door prizes, so I was doubly thrilled. 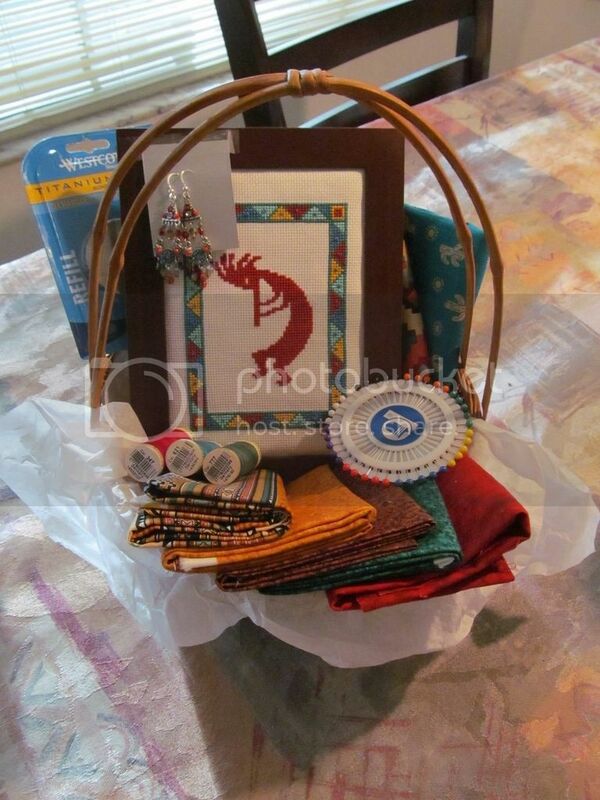 I am in raptures over the framed Kokopelli cross-stitch piece, which I know someone spent many, many hours making. That goes right in my sewing room to inspire me. The titanium rotary cutter blade, Guterman thread and quilting pins are very welcome. I usually don't wear dangling earrings but I'll have to make an exception for these. I've also never tried to make a southwestern-themed quilt, but now I have lots of fabrics for one. And that's it for this year's show. You hit the jackpot! I never win door prizes. So many gorgeous quilts. I have a couple that were given to me as gifts. Every time I use them I marvel at the craftsmanship. I'm glad quilters are getting more recognition now too. It's an art form that's never been given its due. What lovely prizes to win. Lucky you. I'm making my way through the photos in stages, and am enjoying them very much. Lovely & inspiring quilts. Much more intricate than my work! Who knows, one day when I finish work, I might have time to try some of the more complex designs. Great prizes! You made out there. And may they help you create many new fabulous things. I just now remembered something! I took a couple pictures of a quilt I loved clear back in September. It was at the Oregon State Fair, and I'd meant to send you a link to the pics. The pictures aren't great - they were taken with camera phone - but hopefully you can get the idea.